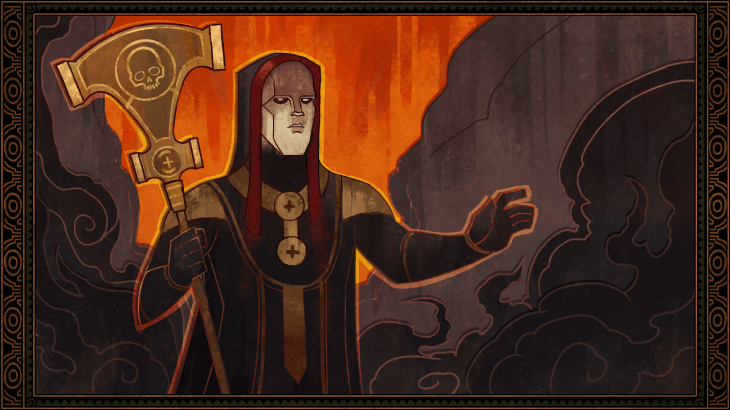 Tunon the Adjudicator is an Archon in Tyranny. Tunon the Adjudicator is the Archon of Justice and creator of the Fatebinders. Eldest of the Archons in service to Kyros, he has served the Overlord for over 400 years. Though legends tell of many Archons of Justice in the years before Kyros’ ascension, none have been born to challenge Tunon’s claim to the title in the past centuries. Tunon is a cold and dispassionate figure, devoid of emotion and sentiment. All that moves him is his devotion to Kyros’ law. His true face is hidden behind a metal mask, his Face of Judgment, so that none may see his expression and so determine his feelings about a case before him. Simple, fair, and just. Many have found their lives greatly improved under Kyros’ rule. They are free from the petty abuses of their former leaders, and governments installed at the Overlord’s command have lifted people out of poverty, and provided stability and economic gain for tens of thousands. As all life is only allowed to exist by Kyros’ hand, it is fitting that the same life be ended by that same hand when necessary. This is also a key component of the Overlord’s control: only by the power of Kyros, whether meted out directly or granted to another, is order maintained throughout the entire realm. Those who carry out the Overlord’s justice are advised to do so with prudence, lest they find themselves subject to the same laws they wielded against others — for Kyros is the final judge and executioner. Although the pendulum of justice must swing equally for all, the rare instances when a Fatebinder has overstepped their bounds and forced my hand to come down upon them for their transgression still weigh upon me. Despite all that I do to instill the Overlord’s laws and sense of justice into the Fatebinders, the power is too much for some, and they stagger, then fall, under its weight. It is a burden only the strongest can carry successfully for long.